Creativity for Teaching is a Continuing Professional Development (CPD) programme for teachers that improves learning outcomes across the curriculum by equipping teachers with tools to nurture and develop the creativity of pupils. There is extensive research that demonstrates the positive benefits for children & young people of learning that allows for and encourages creative thought and experimentation. In this course, we explain why creativity is so beneficial and how teachers can adapt their practice to allow for more opportunities to be creative in the classroom. It’s not about more art lessons, it’s about a pedagogical approach that underpins all learning and equipping teachers with a method for teaching pupils how to be creative. IVE has been at the forefront of creative learning for the past 20 years and have carried out extensive research into the benefits of creative teaching and learning and the best ways to facilitate it. 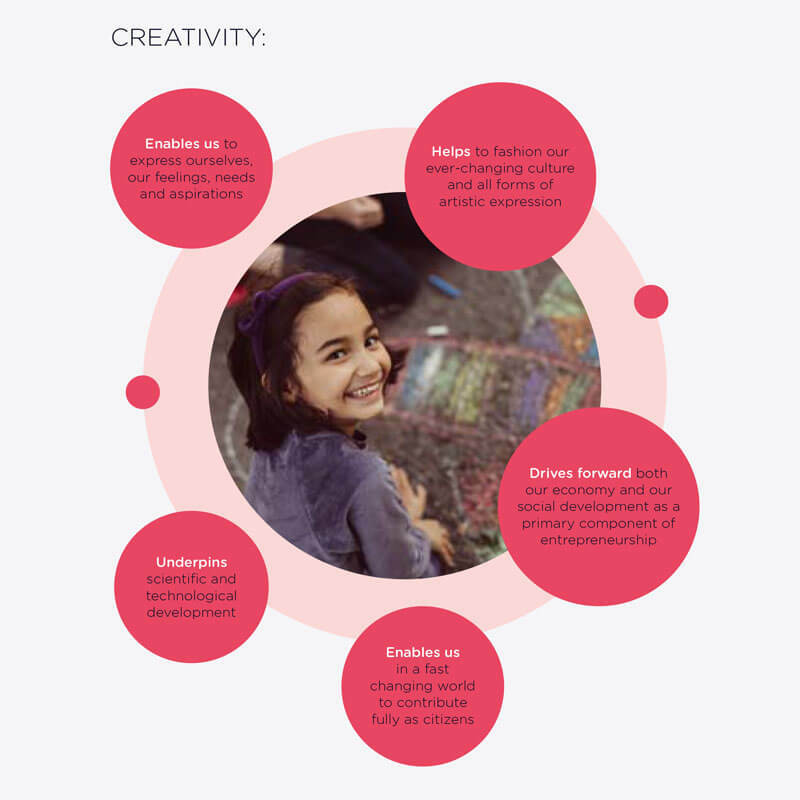 Our research shows us that participation by young people in structured activities focused on creativity improves academic attainment in secondary-aged students, boosts pre-school and primary aged children’s early literacy skills, increases language development and relates learning to real work. On this course, teachers will learn how to incorporate activities that promote creativity skills and creative thinking into all aspects of the curriculum. Teachers will learn how to develop a more creative mindset incorporating imagination, a drive to be inquisitive and the confidence to take controlled risks. Teachers will be supported to develop vision, strategy and structures that support creativity and consciously nurture and develop the creative capacities of their pupils. Our approach uses fun, challenging activities to help teachers make new discoveries and open minds to ‘what if?’, ‘how can we…?’ and ‘let’s try this’. Creativity for Teaching is aimed principally at Primary and Secondary Teachers in any subject but could apply to anybody who works as an educator. Prices depend on the training time and number of participants.